For more information on classes or workshops, contact Lynn. 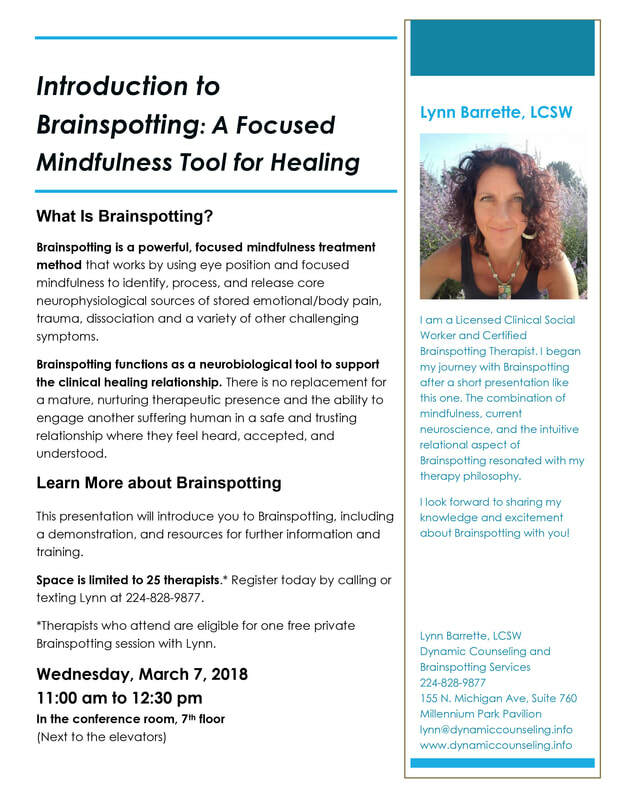 CEUs are available to licensed mental health professionals for the following workshop on Brainspotting. Register by contacting Lynn. CEU information will be available to those who attend. Spiritual School Is in Session, Every Moment! Are you aware of the spiritual school of life, teaching you all the time? Lynn Barrette, LCSW, will be speaking at both services, 9:00 am and 11:00 am, at Unity Northwest Church, 259 E. Central Rd, Des Plaines. A free-will offering is received during each service. All are welcome! 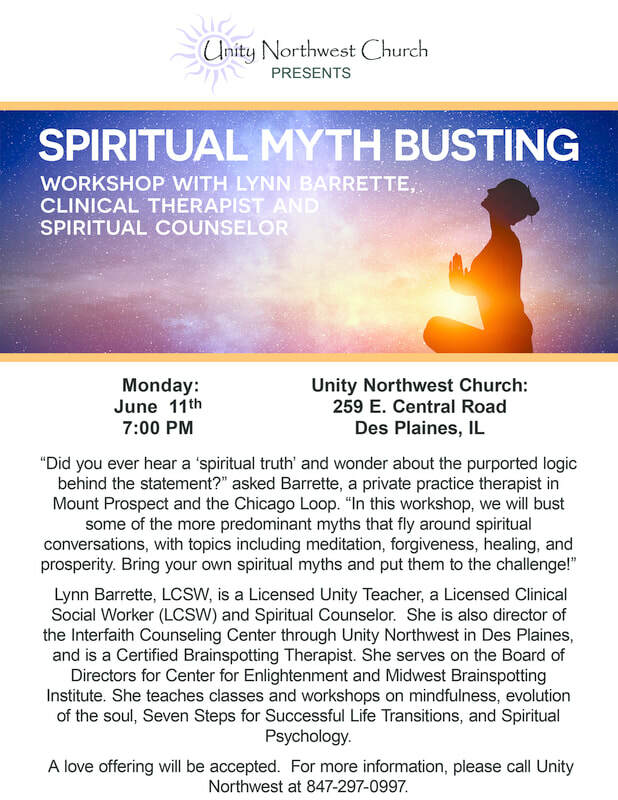 “Mastering Your Emotions” will be taught by Lynn Barrette, spiritual counselor and LCSW clinical therapist, at Unity Northwest, 259 East Central Road, Des Plaines, at 7 p.m. on Wednesday, September 6, 2017. "This class will offer insight into how emotions can serve us, instead of running us" said Barrette. "We will look at what some of our basic emotions are and how emotion can be used to propel us forward; and will learn tools to improve our ability to experience emotions and use that energy constructively." A free will offering will be received during class, and no pre-registration is necessary. 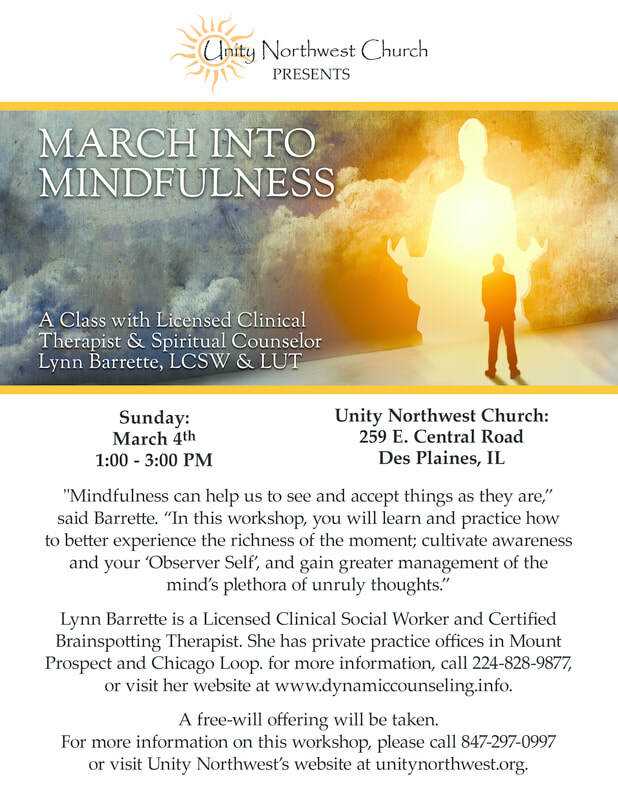 Lynn Barrette, LCSW, is a licensed clinical therapist with a private practice in Mount Prospect. She is a Brainspotting-trained therapist and director of the Interfaith Counseling Center. For more information please call 847-297-0997 or visit Unity Northwest’s website at unitynorthwest.org. To contact Lynn Barrette directly, call 224-828-9877 or contact Lynn here. 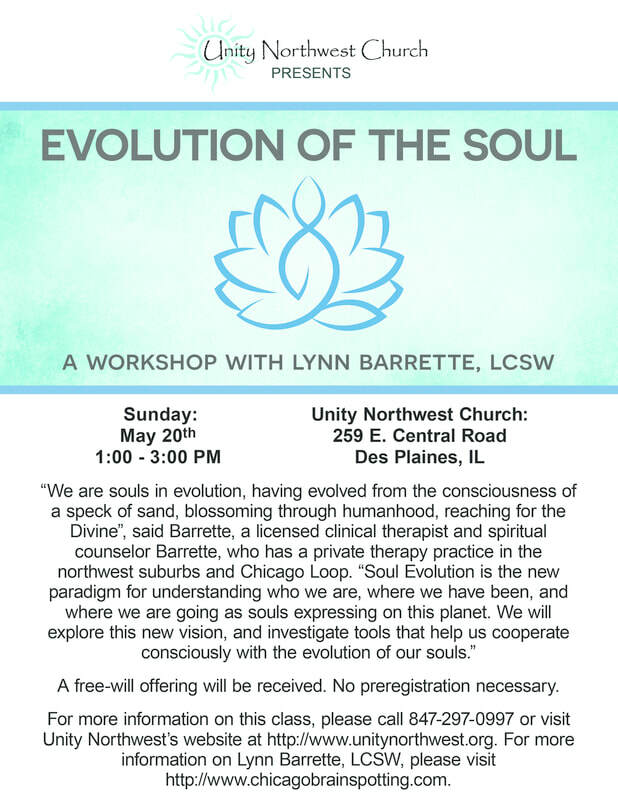 Therapist and spiritual counselor Lynn Barrette, LCSW, LUT, will teach “How Meditation Supports Your Soul Evolution” at Unity Northwest Church, 259 East Central Road, Des Plaines, on Wednesday, September 20, at 7:00 PM. A free will offering will be received, and no pre-registration is necessary. "What forms of meditation are best for soul evolution? What is happening spiritually when you meditate?" asks Barrette, licensed clinical therapist in private therapy practice in Mt Prospect. "During this class we will explore the significance of meditation as part of a spiritual practice, as well as a taste of the brain science behind why it works. We will also have time to practice what we discuss." For more information on this class or other events at Unity Northwest, please call 847-297-0997 or visit Unity Northwest's website at www.unitynorthwest.org. *Fee for parent manual is $10, payable at first class, by mail, or when you register online. Everyday holds opportunities to practice our spiritual wisdom. Solutions come more efficiently as we clear our emotions, work with our intuition, and commit to daily inner maintenance. This workshop will explore what tools to have on hand for those daily run-ins with life’s ups and downs. Receive notificatons about classes and workshops! Mindfulness is a tool, a learnable skill, a lifestyle, that can helps us to see and accept things as they are. In this four-week class series, you will learn how to better experience the richness of the moment; cultivate awareness and your Observer Self, and gain greater management of the mind’s plethora of unruly thoughts. This class is based on the work by Ronald Siegel, PhD, Assistant Psychology Professor at Harvard Medical School, and international teacher of mindfulness and mind-body treatment. Suggested reading is Dr. Siegel’s book, The Mindfulness Solution: Everyday Practices for Everyday Problems. A free-will offering will be received at each class. 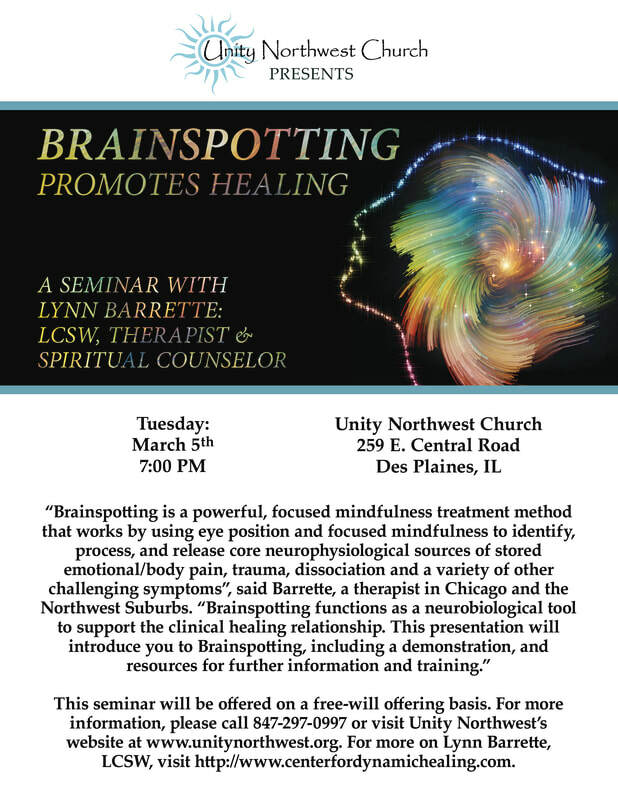 This class will be held at Unity Northwest, 259 E. Central Rd, Des Plaines, near the intersection of Central and Rand Roads. For more information, please call Lynn at 224-828-9877. For directions, call Unity Northwest, 847-297-0997, or visit Unity Northwest’s website at unitynorthwest.org. It’s Your Awakening – Write On! Writing is a tool that is always on hand! Whether you prefer using a phone app, keyboard, or good old fashioned pen and paper, writing down your insights each day is guaranteed to help you assimilate new understandings, support the changes you want to make, and help you remove blocks to reaching your goals. Lynn will help you establish a simple, manageable writing routine that will expedite your self awareness! The first ten people to show up for class will receive a free spiral notebook to initiate your writing practice! A free-will offering will be taken. Call Lynn at 224-828-9877 for more information. Everything needed to raise healthy children is also needed to raise your consciousness. Lynn Barrette, LCSW, shares how the basic tools for healthy parenting also apply to your spiritual growth. Create a safe, healing, creative, focused, accountable, and wise inner environment for the God Consciousness to thrive within you! A free-will offering will be received. Lynn uncovers the benefits of working with "Seven Steps for Moving through Difficulties", a healing process that was taught to her by her spiritual teacher, Jane Elizabeth Hart, Founder of Center for Enlightenment. Lynn walks you through the Seven Steps and why it is an important tool to work with on a regular basis. You will be able to use this process for any difficulty that arises, and move through it from the highest and best within you. Lynn utilizes this process with her clients, as well as in her own life experience. It is a process that has stood the test of time. Lynn will share some of her own experiences with you, and give you an opportunity to work with the steps in class. A free-will offering will be received during class (no set fee), and no registration is necessary. When emotions are used for healing rather than reaction, you can find solutions to problems more quickly and clearly. Leave your outbursts, temper, and confusion about what sets you off behind. Re-engage with your emotions and gain a new understanding about emotional physiology. Equip yourself with tools to improve your ability to experience emotions and use that energy constructively. Practice mindfulness and the concept of the Observer Self. Discover how these practices strengthen your intuitive nature. Each week, you will have the opportunity to practice up to five emotional management techniques, and understand when to use them and why. Gain insight into how your emotions can serve you rather than run you. Use your emotions to propel you forward in your life and consciousness! Our ability to visualize is at the core of creating our world. In this workshop, we will take that ability and apply it to our spiritual growth, creating within us a ‘meditation room’ that we can enter to magnetize solutions to our everyday problems. Knowing that we are evolving souls, growing through the process of reincarnation, under the Law of Karma, how can we support ourselves? 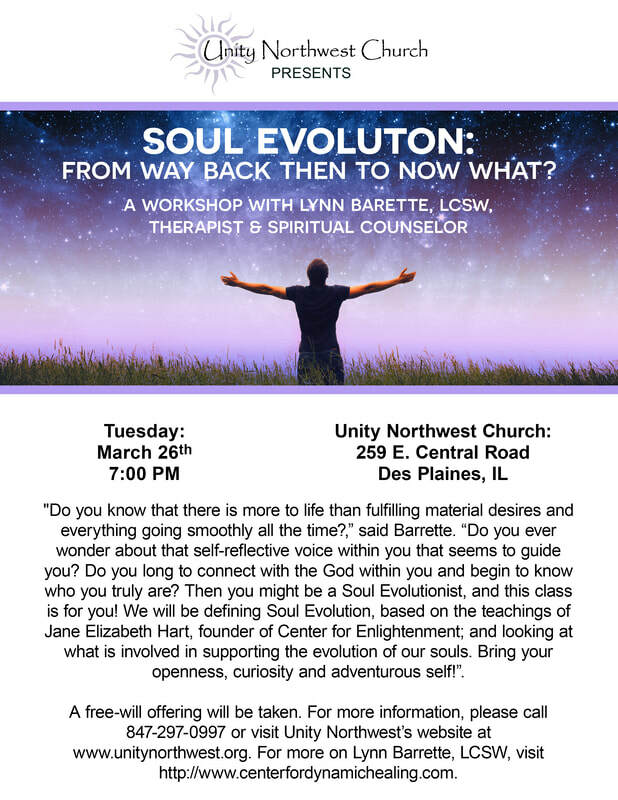 This workshop will give you tools for being an awake and active participant in the evolution of your soul! Learn how to activate your Observer Self, your best friend in this process, and discover how empowered you are! "Karma: Should I Be Afraid of It?" "Spiritual Psychology: The Commitment to Change"
"The Gift of the Seven Steps"
The Seven Steps by Jane Elizabeth Hart"
"Practicing the Power of Now"
"Discover the Power Within You"
"Reincarnation: A Platform for the Evolution of Your Soul"
"Tools for the Spiritually Minded"
"Five Tools For Inner Housekeeping"
"Becoming a Love and Logic Parent"
"What Does God Think of Addiction?" For more information on classes or services, contact Lynn.